Why, oh why do I always make the mistake of ordering a bunch of stuff just before a holiday? Not only did I miss out on all the Labor Day sales, my deliveries were also pushed back several days because of the holiday weekend. First world problems, am I right? Anyway, I got a boatload of makeup delivered to me today from Ulta, Morphe, and Kiko Milano so prepare yourselves for some of my favorite posts: hauls! I decided to start with the most exciting one, which is my big Ulta order. 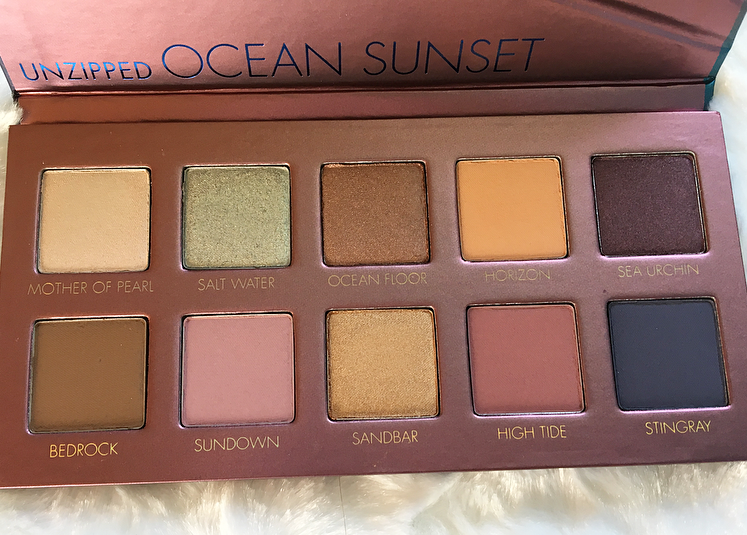 I've been wanting to get my hands on the new Lorac Ocean Sunset Unzipped palette but it's been out of stock for weeks. I signed up for the email list and the same day that the palette was restocked, Ulta had a deal where if you spent $75 you got a 19 piece gift set of a variety of sample products. Obviously I couldn't miss out on something like that, and I usually spend over $75 at Ulta anyway when I shop online, so I jumped on it. My original reason for making this purchase, I was really drawn to the gorgeous colors in this palette. I have way too many neutral ones, so I loved the unusual shades in this paired with some standard neutrals. The sea green one is so pretty, along with the shimmery plum. I've always been really happy with the Lorac Pro formula and the Unzipped one doesn't disappoint, either! I'm going to start using this soon and review it. It also came with a Behind the Scenes eye primer which I will give to my mom, I know she likes this one. Everyone with dry skin seems to love this primer, so I decided to finally pick it up! The packaging is beautiful and to me it has a faint Fruit Loops scent...am I crazy? My best friend used to love this primer so I'm hoping it works well for me, too. It's the first high-end on that I own. I recently learned that Batiste, my favorite dry shampoo brand, may not be cruelty free. My cherry scented one is running out quickly so decided to buy a backup. This is one that I haven't tried before, but I've heard good things about. I adore the scent of the Zoella Beauty Sweet Inspirations line, so I was excited to hear about her newest line, Jelly and Gelato. I love the packaging of this but unfortunately that's the best that I can say about it. I really dislike the floral scent. I think it's a personal thing as I've read a lot of reviews saying that they love the scent and find it more mature than Zoe's past lines. I'll try to use it but I might have to give it away because certain fragrances give me headaches. This is obviously too big to really describe thoroughly--in fact I'm feeling overwhelmed by the samples in here! I think there's a good variety of fragrance, makeup, skincare, and haircare and a lot of good brands included. 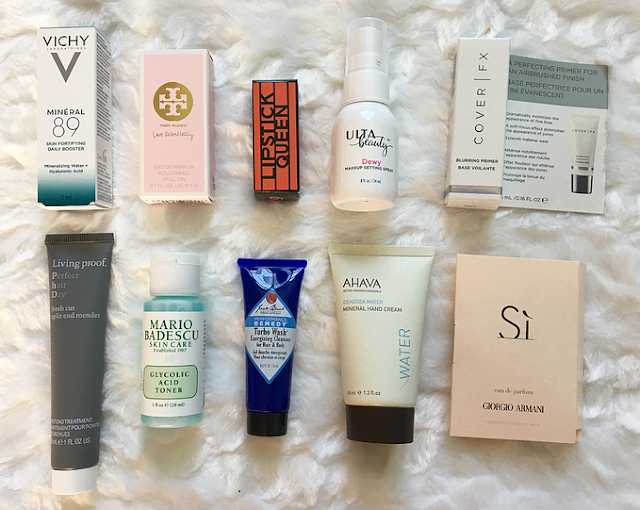 I've only tried one of these products before so if you have tried any others, please let me know what you recommend! I've never tried this brand, but I love hyaluronic acid and moisturizers so might as well put them together. This smells like a perfume I've had before, but I can't remember which one. It's floral and sweet, quite mature. Not something that I would wear often. It has notes of pink pepper, patchouli, rose, and amber. I adore shades like this for fall! It's a creamy dark mauve shade. I don't use many setting sprays, so more than anything this is a reminder to use the ones I own. Like I said, I haven't tried many high-end primers so I'm glad to have this good-sized sample! Those little packets that are usually included as a sample are not big enough to truly determine if it's a good product. No products are able to mend split ends; once they are created, they stay until they're cut off. Therefore I don't think this product will do anything to help my split ends, but I'm hoping they prevent them! I'm about a month away from finishing my Elizabeth Arden toner, so then I will start trying this out. I've heard great things about this brand so my hopes are high. Is anyone else skeptical about a product that's for both hair and body? I don't think I will be using this, unless maybe I'm sick because it smells exactly like Vix Vapo Rub! Hand cream is something that I wear everyday, especially in the winter, so I'm always happy to have a new one. It's a nice autumn/winter fragrance, but again, not one that I would purchase for myself. It has blackcurrant nectar, airy florals and blond wood notes. I never use products like this so I'll pass it on to someone who will use it. I'm feeling pretty 'meh' about this product. I haven't heard of this brand before and it doesn't sound like a product I'd be enthusiastic about. This isn't even close to my brow color. I actually don't think I know anyone with this blonde shade, so I don't know who I would give this to! Angel is one of my favorite perfumes so I was excited to smell this one! My first impressions are pretty good. I think it could grow on me. The key notes include Jasmine Sambac, Cashmeran Wood, and Amber Gris but I don't get a strong floral vibe from it. If I worked out I'd be pretty excited about these. I think I'll keep them in my car for emergencies. They sound really nice and I've liked other Pacifica products I've tried! To be honest I have at least a dozen mascaras to use before I can get to this one, but the wand looks promising. I liked curved ones. I'm curious about this because I like moisturizers, but I hate skincare products in a jar. Often when the ingredients are exposed to the air it lowers the effects that they give. I'm sure for a small jar like this it won't be a huge problem, but it's something to consider if you're thinking of picking up a full size. I'll probably take this with me when I travel, along with a lot of these other skincare products! 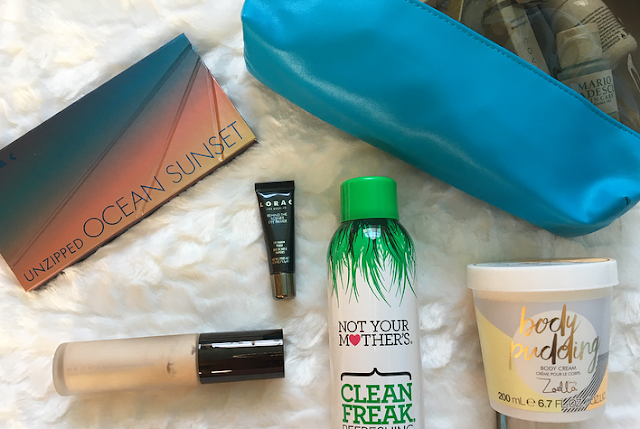 And some other samples included in my order were the Olay Regenerist Luminous Tone Perfecting Cream Moisturizer and the Elizabeth Arden Superstart Skin Renewal Booster. Those are just in little packets, so I'm not super excited about using them. 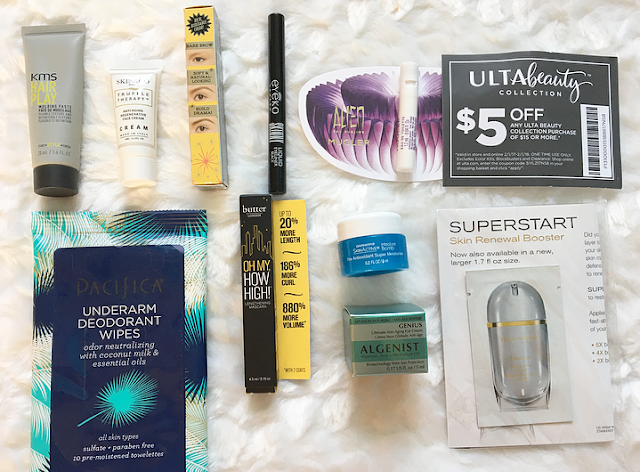 20 comments on "A Big Ulta Haul"
I wish we had Ulta here in Portugal! You bought nice things! :9 That Lorac palette looks so pretty! I really like their eyeshadow primer. You got a great sample bag! I like purchasing when they have those bags. Fantastic haul. I love to shop at Ulta when ever I am in the US. Holy cow! Now this is what I call a haul! I love Becca Backlight Primer Filter and should really use it again!